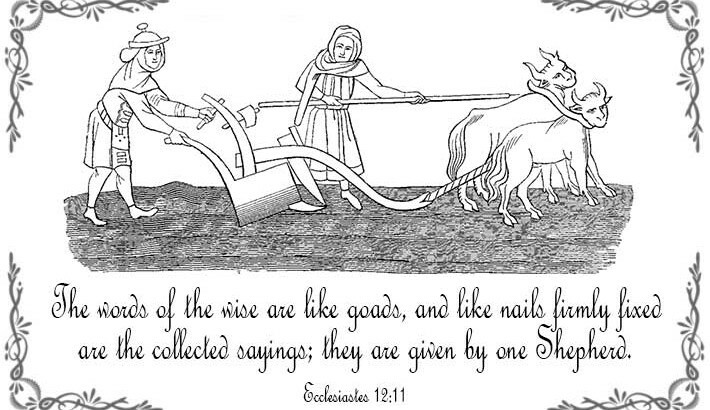 Ecclesiastes 12:11 talks about truth being a goad. Merriam-Webster defines a goad as, “provoke or annoy (someone) so as to stimulate some action or reaction.” Using that definition, Ecclesiastes is saying that knowing the truth bothers us until we respond to it. If God is truth and truth sets us free both of which seem like good things, then why does the Preacher say here that it’s an annoying goad, which sounds like a bad thing? What does knowing this change about listening to the Spirit? In order to understand the goading better, let’s start by going back a few verses in chapter 12 to see more about what the Preacher is talking about. In verse 9, Ecclesiastes says, “Besides being wise, the Preacher also taught the people knowledge, weighing and studying and arranging many proverbs with great care.” (Ecclesiastes 12:9 ESV) The Preacher didn’t just shout out an opinion, he studied carefully to find truth. In verse 10, it says the proverbs that the Preacher collected are given by one Shepherd, meaning God. 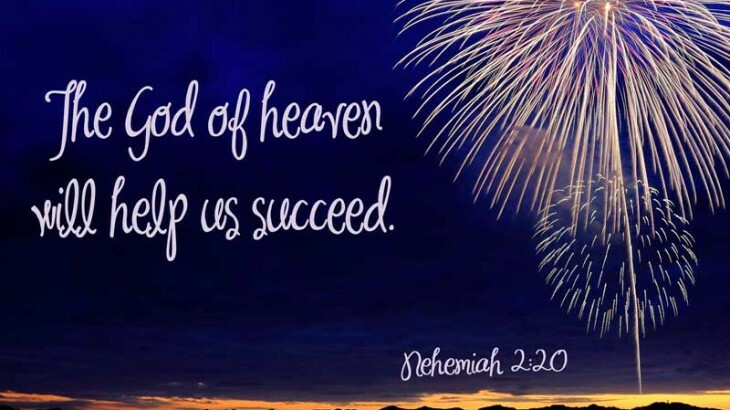 The wise man, the Preacher, searched out diligently the wise and good ideas and then taught them and shared them, because he knew that all wisdom really comes from God. This is important to know because it can be easy to dismiss wisdom or truth as something that’s simply someone else’s opinion. God is the giver of all wisdom and all truth, no matter who we think it’s from and no matter who tries to take the credit for it. Truth can come directly to us from God (John 14:26), or it can come through the wise teaching of men who are seeking the Lord. This doesn’t mean that we listen to anyone who claims to know something we don’t know. Just because someone speaks confidently, doesn’t mean that they have the Spirit of the Lord leading them, no matter what they claim. So, how do we know the difference? Sometimes, it can be very difficult if not impossible just by listening to someone’s words to determine if the Lord is leading them or not. Most of us know that we need to know the scriptures and compare what their saying to that. A teacher being led by God won’t contradict the truth of Himself that He’s already taught us. However, there’s an icky truth about false teachings that Apostle Paul warns us about in 1 Timothy 4:3, “For the time is coming when people will not endure sound teaching, but having itching ears they will accumulate for themselves teachers to suit their own passions,” (ESV). He’s warning us here that the reason that false teachings are appealing to us is because they are telling us what we already want to hear. We are seeking validation for ourselves or our emotions or maybe our life choices. Whatever the thing is, we want to be able to fulfill our passions guilt free, so we listen to people to are not sharing truth in order to feel good about it. This is why the Preacher back in Ecclesiastes called truth a goad. It doesn’t only tell us what we want to hear, it tells us what’s going to make us like the Shepherd (Romans 8:29). Seeking comfort is a big deal to anyone who is human, so choosing to listen to a voice that tells you uncomfortable truths is not our first response. These goads are what keep us from settling in to a life of selfish pursuit of passions. The Spirit prompts us to move and not give in to apathy, prods us to keep us from settling for less than who God made us to be (hint: servant of all), and it reminds us that we are sinners who must always rely on grace. The worst thing about uncomfortable truths isn’t just that they can be unpleasant. The worst thing about them is what makes them unpleasant. When God uses truth to change us, He starts by showing us who we really are. We’d like to think that He’s showing us difficult or challenging truths and the uncomfortable part is how hard we’re going to have to work to get there. That’s not it, though. God shows us who we are in the light of who He is. The uncomfortable part is that it’s dark, dark sin that separates us and nothing we can do will bridge the gap. Even after years of walking with Him, we must still be willing to acknowledge both current sins and our selfish temperament. The next important thing about a goad, as defined by Merriam-Webster, is that it stimulates some action or response. A goad isn’t a goad if nothing changes after it’s been applies. Sometimes we have emotional moments where we feel like we’re never going to be the same. Or we have intellectual moments where we think we understand God on a whole new level now. In either case, it’s only a truth about God when we come away having been changed. There’s nothing wrong with either emotional moments or intellectual moments. In fact, sometimes we need to pile up several different moments over a long course of time in order to build up the momentum we need to change. However, if encounter after encounter happens and we always revert back, then we’re not really facing the real prod. We’re getting close enough to feel excited, but not close enough to see the truth about what needs to be different. These aren’t pretty truths, but they are the wisdom of God who wants to spend eternity with us. He is reminding us of uncomfortable things so we can end up wrapped in His bliss for eternity. Let truth goad you. Let yourself be prodded by the Holy Spirit so that you can be more and more like Christ. The conviction in the words of Jesus can sometimes hit straight into your heart. Two verses in John are ready to stab piousness, no matter how little or how deeply it’s buried in our hearts. 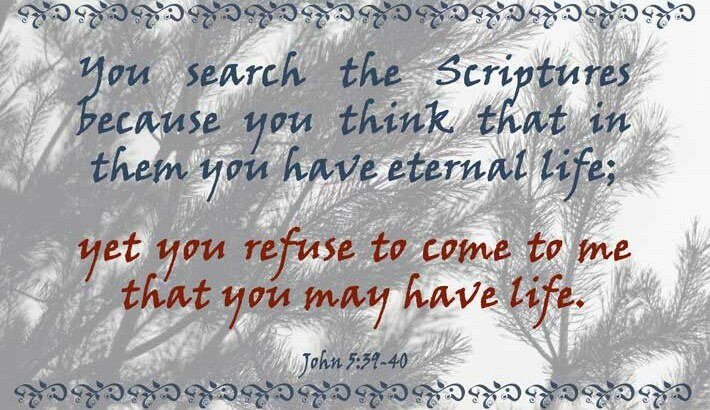 These verses are John 5:39-40 and they talk to us about living a life of theological understanding instead of life changing understanding. In these verses in the fifth chapter of John, Jesus is responding to the complaints that he’s making himself equal with God and not keeping the Sabbath day holy (John 5:18). He is offering to the blind religious leaders a chance to hear Him and see Him as the Messiah. If they saw Him as God intended them to, they probably wouldn’t have condemned as a rule-breaker. If you meet God incarnate and He healed someone, would you quibble with what day of the week it was? The problem was that the beliefs of the religious that were based on scripture were blinding them to the Truth of God in front of them that was real and living. The painful thing about this truth is that Christians today are doing the same thing. We search the scriptures, but instead of doing it to meet God, we do it to be right or to increase our own personal understanding. We forget the not only is God real, but Jesus is real and the Holy Spirit is real, and they are trying to be real part of our life. Searching the scriptures apart from the guidance of the Holy Spirit is walking with the risk of becoming spiritually dryer and dryer until we become nothing but dust on the inside. At that point, the only thing we know how to do is try to take the spiritual life and freedom out of others until they are as dusty and dry as we are. Remember, we became dusty and dry by studying the Word of God, so it’s easy to fall into putting down others who disagree with us. We forget that the knowledge of God through Jesus Christ is given by Jesus alone, not by an intellectual understanding (Matthew 11:27). How many battles have we waged with the words, “But the Bible says…”? How many times have we spoken condescendingly over a situation because we know what a “Christian should have done”? These words and judgmental attitudes are symptoms of a drying up Christian, of someone who’s using the Word of God without the power of a relationship with Christ. This will destroy us and damage the testimony of all Christians if we don’t live in the truth of what Christ did and the knowledge of Him personally. Fight the temptation to be today’s Pharisees who use the Word to grow in piousness and selfishness. Instead, use the knowledge of Christ to study the Word to bring life and joy and fruit (John 15:8). What a relief! No more fear and insecurity about making the wrong choice. Even if I don’t get it right on the first try, as long as I keep humbly seeking the Lord’s face, I don’t have to fear. Deceivers come and, unfortunately, they aren’t going to stop coming. However, I don’t fear them and I don’t let them influence me. I trust the guidance of the Holy Spirit to show me that they are not working in His truth. 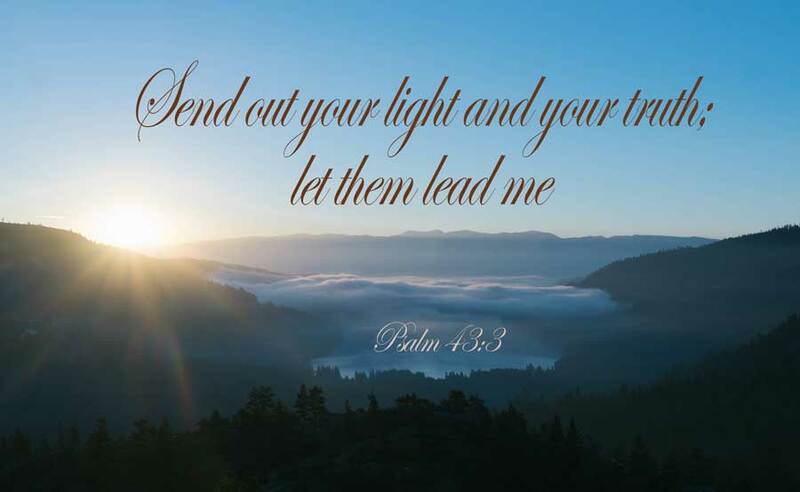 Psalm 43:3 says, “Send out your light and your truth; let them lead me; let them bring me to your holy hill and your dwelling!” By stepping in to the light and the truth, by stepping into a relationship with Jesus Christ, I’m stepping into guidance that brings me to the dwelling place of God. This, of course, isn’t an earthly place, but a heart condition (John 4:32). Is God doing this because of who I am? No, He does this because of who He is. All people have access to His truth and all people can be lead into His presence. God is not a respecter of persons (Romans 2:11), meaning He doesn’t play favorites. He is calling to all people, no matter your past choices, no matter your religious (or self-righteous) past. He loves you and He will lead you to see Him and know Him (John 17:3).